The origins of ice hockey date back to the 19th century in Canada where adaptations of the modern day hockey game were played in icy conditions. Since then the sport has gone on to become one of the largest in the world with the major participants originating from North America. The NHL (National Hockey League) is the largest league in the world and currently turns over millions of dollars each year. The object of the game is to hit a small puck across the ice before then hitting it into a goal with a hockey stick. Every time the puck goes into the goal then one point is awarded for that team. The puck can be passed around the players on the ice and it’s the job of the opposition to try and prevent the other team from scoring. The team with the most goals at the end of the game are declared the winners. Should the game end in a tie then the game will go into overtime where the first team to then score will be crowned winners. The game is played on an ice rink measuring roughly 61m in length by 30m in width. The rink is split into three main sections. The middle section is the neutral zone and includes a centre circle where the games start. At either side of the neutral zone are attacking and defending zones of which are determined by whichever team has the puck at the time. In each attacking and defending zone are two end zone faceoff circles and spots. There is a goal crease which is a half circle surrounding the goal. Behind the goal is the boards area. Each player will have their own hockey stick along with ice skates and a series of padding which may include face mask, helmet, padded shorts, shoulder pads, arm guards and gloves. Each goal tender will have the same but on a much denser scale due to them being in the firing line of the puck much more often. Each team can have a maximum of 20 players. Of these 20 players only six may be on the ice at any one time. The rest will be used as substitutes but can come and go from the game as often as required. The six starters include a goal tender and 5 outfield players. Whilst each player will be given a position, the players are free to move around the ice as they choose. This does exclude the goal tender of which must remain within their half and not pass the center red line. The players hit what is called a ‘puck’. The puck is heavy object made from dense rubber and weighs roughly 6 ounces. The puck is hit by either a players stick or foot but at no point can the puck be handled by any player other than the goal tender. Each game lasts for three 20 minute periods. For every stoppage in the game the game clock is stopped and as soon as the time is up in each period then the game will instantly cease. To score a goal a player must hit the puck over the goal line. They can use any part of their body or their stick to do so but cannot use their hand. The whole of the puck needs to cross the line to be deemed a goal. In professional leagues like the NHL the goal line has a sensor running across it which indicates when the puck has fully crossed the line. In amateur leagues the judgement of the umpires are taken into account. To win a game one team must score more goals than their opponents. If the game is a tie then the game goes into overtime and an additional quarter is played out until one of the teams score. The first team to score will be the winners. The game starts in the centre circle with a face off. This is where the referee drops the puck in between two opposing players who then scrap to win position for their team. A faceoff may also be used to resume play after a stoppage in any of the attacking or defending face off zones. Players may use physical force to win the puck off their opponent. Body checking can be used but is not prohibited in the back or above shoulder height. 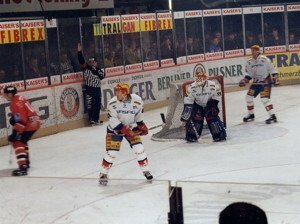 Players who are imposed to have committed a minor penalty will be ordered to leave the ice for two minutes and their team play with 5 players for that duration. If the opposing team score a goal within those two minutes then that player can return to the rink immediately. A minor penalty can include tripping an opponent with their stick, holding with either their stick or hands, hooking with their stick or body checking a player without the puck. Major penalties will result in a player being removed from the ice for up to 5 minutes. These may include fighting, inflicting serious injury on opposing players or continued minor violations.